While it has felt like spring for several weeks here in Oregon, the season has finally arrived. When the cold, wet months that mark Oregon’s winter finally break for those cool spring days we’ve come to love, it means warmer weather and the start of allergy season. However, you may not realize that increased pollen counts, hot dry air and humidity have an impact on more than watery eyes and running noses. These conditions can also affect your oral health, as well. If you’ve ever taken a deep breath of cold wintery air and felt a sharp ache in your teeth, you have experienced tooth sensitivity. A number of factors can cause tooth sensitivity due to weather temperature. These include large cracks or microscopic fractures in tooth enamel; cavities; weakened or thin tooth enamel, and gum recession. Temperature sensitivity can also be the result of bridges, crowns, or fillings that no longer fit or have eroded over time. Fortunately, your tongue, cheeks, and lips help to insulate teeth from the cold air, so make sure to breathe through your nose when out in extremely cold weather to reduce your exposure to temperature sensitivity in your teeth. If you frequently suffer from tooth sensitivity, you may want to consider the use of toothpaste or mouthwash specifically formulated to reduce symptoms of sensitive teeth by creating a protective barrier over tooth enamel. You should make it a point to schedule regular checkup and cleanings with Dr. Kirchmeier to reduce the factors that cause microscopic cracks or weakened enamel to occur. Once the weather warms, your oral health may still be affected by seasonal allergies, as well. Allergies cause sinuses to swell due to congestion. When sinuses begin to swell, they place pressure on the roots of our teeth, which causes feelings of pain and discomfort. Frequently, you’ll experience this type of discomfort is the upper back molars. You can alleviate the discomfort by treating the sinus condition to relieve some of the built up pressure. However, it can be tricky to determine whether sinus pressure is causing your toothache or if the discomfort is being caused by another oral condition. Dr. Kirchmeier can look for other potential causes of tooth pain to rule out infection, and can recommend any needed dental treatment if an oral health problem is detected. Whether dealing with cold air or seasonal toothaches, it’s important to remember your oral health year-round. By brushing at least twice daily and flossing at least once a day, you can maintain your oral health and lower your risk of tooth decay and gum disease. The healthier your teeth and gums, the less risk you’ll have of suffering from tooth sensitivity or allergy related toothaches. If you have any questions about how the weather or allergies can affect your oral health, make sure to ask Dr. Kirchmeir or any member of our experienced staff at North Eugene Family Dental. 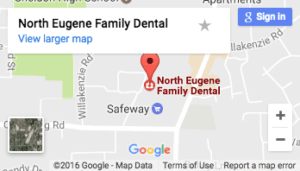 If you need to schedule an appointment the best dentist in Eugene, Oregon, call us at North Eugene Family Dental, at 541-343-5512 or click here.